The Watson Battery Adapter Plate for EN-EL20 or EN-EL20a enables you to charge any Nikon EN-EL20 or EN-EL20a type battery using your Watson Compact AC/DC or Duo LCD Charger. 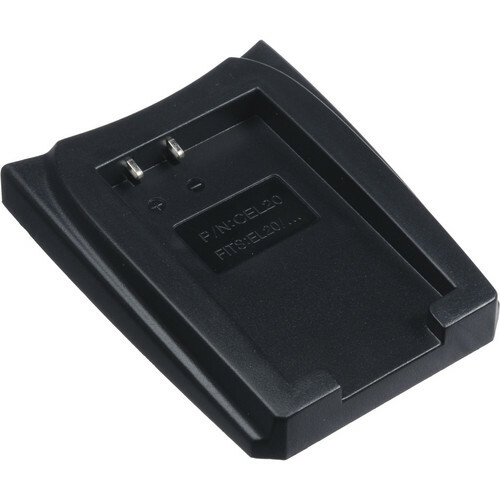 Box Dimensions (LxWxH) 4.4 x 2.4 x 1.1"
Battery Adapter Plate for EN-EL20 or EN-EL20a is rated 5.0 out of 5 by 9. Rated 5 out of 5 by Theodore E from Great Charger I purchased this charger originally for sony equipment and using the Sony batteries. After I purchased the Nikon cool pix 1000, I needed an extra battery and also needed a charger. Using the Watson battery charger made it extremely easy because all I needed to purchase was the plate for the Nikon batteries. I highly recommend using the charger because it is very efficient, it is also very portable, and the use of interchangeable place for different brands of batteries mess there's makes this extremely useful. Rated 5 out of 5 by Joseph from Very handy I generally take four cameras (2 DSLRs, one Superzoom, one P&S) when I go out to do some serious photography. Rather than take three seperate chargers I only need to pack one charger unit and the appropriate number of adapter plates. Cuts down primarily on space I need. Rated 5 out of 5 by Mark from Works pefectly I already own the watson dual bay battery charger for my other camera's being able to purchase just a plate for other batteries is a great feature. batteries lock in perfectly and make contact for charging. easily swapped out between models. Rated 5 out of 5 by Augusto C. from Perfect addition to my charger I have several brands of cameras and these fit very well with my Watson charger. Thank you for these adapters, i can use one charger for all of my batteries. Rated 5 out of 5 by KIINUH F. from A simple yet very important little part A simple yet truly important little part that brings power back to our BMDPCC, whenever one is in need of keeping one's film shoot going. Rated 5 out of 5 by EditMeNice from Versatile I use four or five different kinds of batteries. It's nice not having to buy a separate charger for each one, especially when I travel. Rated 5 out of 5 by Bluespider from Its fine It functions. For the price I'll give it 5 stars.